I will add, however, that our disagreement relating to the process involved to determine a Suwon crease isn't an issue. Many research reports include the statement that researchers disagree or have different opinions and results. I think it's a good thing and can only help in the fine tuning. The actual lines they drew are less imaginary than your idea of a straight line. If they didn't want us to visualize the shape, they could have just placed dots and then we could imagine how to connect those dots. Patti wrote: I don't think I have misunderstood or misread the report. We simply disagree. "Fig 7 - Incidences of the starting and termination points of the radial longi-tudinal crease (I), proximal transverse crease (II), and distal transverse crease (III) of normal, simian, Sydney creases in Koreans. Numbers 1, 2, 3, 4, 5 in illustration mean frequent cases of the individual palm creases." 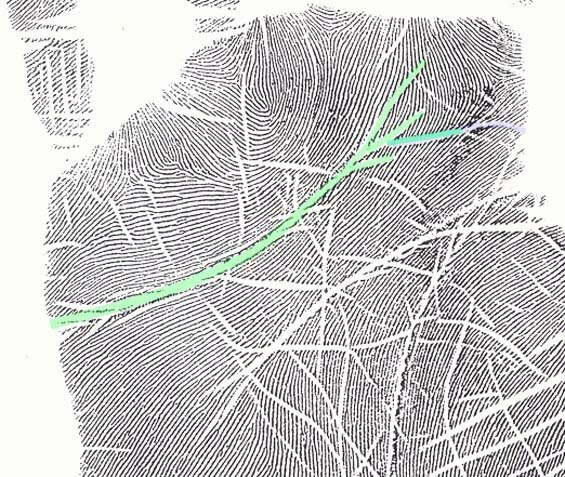 ... so one can not consider here the aspect of whether the lines involved are 'parallel', because that requires the opportunity to actually see the lines and not just the starting and termination points. And again, one can also not describe the no.1 and no.2 variants of both pictures as related... this is also very clearly indicated by the percentages featured with both pictures. I do agree that 1 & 2 are not necessary directly related in the examples of Accessory III and II + III. But, it does illustrate that there are a variety of combinations - perhaps some of the variations are parallel, but that is not a requirement. Patti, again, please read the title of figure plus the percentages for the variants no.1 and no.2 ... the figure is clearly only meant to describe the locations where the lines typically start and end, and the percentages indicate that you can certainly not 'connect' nor compare the variants between those pictures. And if you would have studies the Sydney pictures closely ... then you should have notice that in picture 'accessory III' both lines are located in the 2nd row of the little squares, while in picture 'II+III' only variant 4 parly overlaps the 2nd row of the little squares. Conclusion: all lines are sort of positioned 'parallel'... except for the variant no.4 in picture 'II+III', but your were only talking about the variants no.1 and no.2. 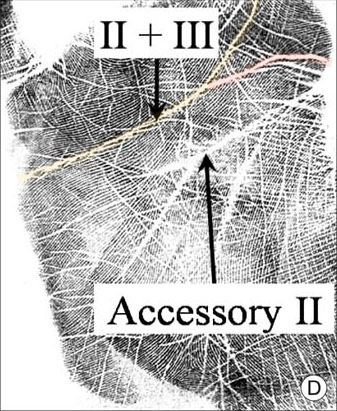 "The two most common locations of Accessory III are not parallel to the most common locations of II + III. ". Finally.... great to hear that you now understand that as well! By the way, variant no.1 is positioned in the 3th row of the little squares, and in picture 'II+III' is variant no.1 positioned in the 2nd + 3th row of the little squares, and therefore both lines variant no.1 can be described as 'parallel'. And I can make a likewise statement for the variants no.2, so I still don't understand why you claimed that they are not parallel. PS. Anyway, now that you at least agreed that one can not compare these apples (II+III) with those pears (accessory III)... maybe we should agree that comparing the imaginary 'connecting lines' in those pictures, is not going to help us any further in fingding agreement about the definitions. 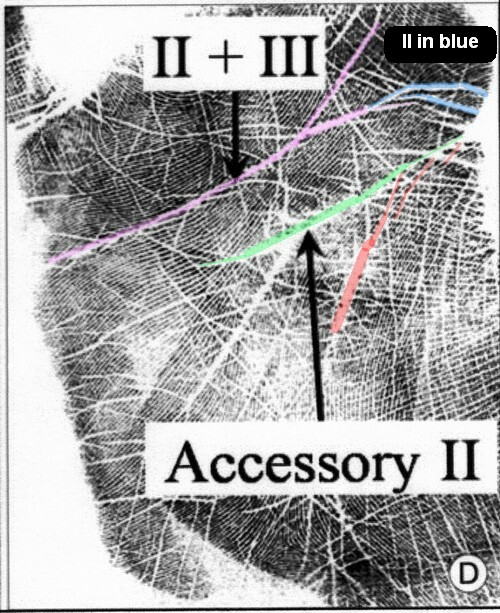 I continue to disagree that Accessory II must be parallel to the II part of II + III. Nor is it inferred or implied in the Korean's report. ... yes, I know that this is your 'opinion'. But I still haven't seen any observation from you side which provides you a clear argument to disagree here. Because you really need to have a clear argument, for I have described the two passages in the article which explicitely mention that in order to speak about an 'accessory' crease, the two crease involved are required to be positioned 'parallel' (and have enough 'length'). So, I still don't understand why you can not accept that aspect as a requirements - next to the other requirement that both lines are required to have enough length. By the way, both aspects are confirmed by the two most common examples for the 'accessory III' variant in figure 7: because both can be described as positioned 'parallel' to the four most common variants of all 'II+III', and both also have enough 'length' - because both of the most common 'accessory III' variants are longer than half of the palm width! MY CONCLUSION: Figure 7 confirms that both requirements which are mentioned in the definition of an 'accessory crease' (fig 5 mentions the requirements: 'parallel' + 'length') are certainly decisive for the accessory aspect in the Sydney line variants. And so far I have not seen a single 'clue' which contradicts my conclusion that both aspects should also be applied to the 'accessory II' aspect of the Suwon crease. Perhaps it's your interpretation of "parallel" that is needed. In the discussion thread relating to Kiwihands' triradius, you insisted that parallel was meant literally and I argued that parallel was only necessarily for a very small degree before they diverged (as supported by the FBI's rules). Now it seems your concept of parallel includes angling away rather than running parallel. In the above sample only the last part II of II+III is parallel to Accessory II. "To define the major palm creases more strictly, the remnants (the minor palm creases must be defined simultaneously." "In the other category, minor palm creases are defined as palm creases apart from the major palm creases, crossing major palm creases, or connecting to the major palm creases by the sharpened end." The crease marked in pink above is a Distal Transverse Crease that "forks" (Fig. 5 - B) The ends taper or are 'sharpened ends'. The blue marked creases are rising creases that taper or have sharpened ends that touch the DTC. The blue colored creases and the green colored creases do not begin parallel. The only location they are parallel is where the blue colored creases are no longer influenced by the mechanisms that create the minor creases known as the 'empathy lines'. After these impathy lines the blue creases are then influenced by the mechanisms that form the minor crease known as a variant of the 'girdle of Venus' or Passion line and the DTC or heart line. It is only random that there is a short parallel section, and lacking this parallel spot would not disqualify this as a Suwon crease. Patti wrote: Perhaps it's your interpretation of "parallel" that is needed. Patti... earlier in this discusison I have given you multiple arguments why you should not describe the Suwon crease example in the Korean article as presenting a heart line with a splitting. So, all I can add here is that in my perception the 'parallel' parts are actually much longer than what is suggested by the colours in your picture. By the way, your suggestions regarding the possible need to focuss on how I define the word 'parallel' and how I used the word 'parallel' in the perspective of a completely other topic (discussions about fingerprints)... ... I only recognize that as 'suggestive rethorics', because I don't see how this could relate to the passages that I highlightened from the Korean article. Perhaps you could repeat again how you came about extending the Suwon - and follow the guidelines from the Suwon report as I did. Well, I remember that my arguments were quite simple: (1) the 'orange line' is a continuous line, and (2) especially the second part of this 'orange line' is WIDER than any part of the heart line, and finally (3) both parts have a likewise width as is seen in almost the complete 'accessory II' line. Then, by combining these three rather simple observations, I think it is quite obvious where to locate the point were both lines meet (II+III). And I don't see how any of these three observations + the resulting conclusion could violate any passage in the Korean article. Unless you use the Korean's methods to describe major and minor creases your method of describing the orange line is in direct violation. Please show a direct quote from the Korean report that supports your statement "WIDER than any part of the heart line" is more than just your opinion. <edit> as relative to calling it the II part of II + III. In the hand sample, all of the creases in the distal third of the palm are strong. The creases fade with a very weak thenar crease. In my opinion the Suwon crease in this palm is, as the Korean's report, based on strong hand grip. Not the grip of a naturally physically strong person because of the low vitality indicated by life line quality. These deeper creases at the top of the hand, in my opinion, relate to compensation for needed hand strength. The many horizontal creases on the hypothenar/percussion would represent to me a restless, active individual. Short head line, quick mind. This need for greater hand grip and using hand in a gripping position is relative to the depth of the creases, as I see it. Susan Tucker Blackburn in "Maternal, Fetal, and Neonatal Physiology" states that all parts of our bodies, during development and afterwards relates to "use it or lose it". Loss can relate to a decrease in capabilities. In this sample of the Suwon crease, the thenar crease, or life line, is weak, indicating to me that there is weakness in that area of the hand since before birth. The thumb is important to grip and the weakness has been compensated for in the use of the index and other three fingers reflected in the depth of the Suwon crease, in my opinion. I've been reading this thread when I can over the weekend but not had time to reply. Sorry Patti but so far I have to agree with Martijn, as far as the Korean report goes. I can understand the points you are making as possibilities. Because the report only shows us one example of a Suwon line, I think there is more to be discovered & explained about this line. (edit) PS but that's just my opinion & how I interpret the Korean report! accessory II has a forked start - the blue line (II) is only parallel to the part of accessory II that starts under the lifeline (I) and for sure it isn't positioned 'horizontal' as Martijn claimed on page 4 of this discussion ?!? Lynn wrote: I've been reading this thread when I can over the weekend but not had time to reply. Sorry Patti but so far I have to agree with Martijn, as far as the Korean report goes. I can understand the points you are making as possibilities. Because the report only shows us one example of a Suwon line, I think there is more to be discovered & explained about this line. And then you disagree that his sample is a Suwon. Please don't just make a blanket statement that you agree with Martijn. It's not about agreeing with me or him. I'd rather see you describe to what you agree or disagree. Or your interpretation. Otherwise it becomes some kind of "sides" thing. I don't wish to participate in that sort of activity. My multi triradii can't handle the rush. Patti, I have used the Korean method to describe the major creases! All creases that I have mentioned follow the guidelines in the article: they are wide enough because they are wider than twice of the epidermal groove width (and by the way: you have used all lines as well which I have mentioned). I have only added some FACTS regarding the width of those major creases! Patti... have you also forgotten that I described in the other discussion - after zooming in on the details - that all head line parts are about TWICE AS WIDE as the heart line parts!! Yes, your argument formally does not violate the guidelines in the article, however, I would like to add that your argument does violate my feeling for common sense! The researchers do not talk about width variations in the major creases at all, but you are putting the world 'upside-down' to claim that just because I am talking about some details which are not mentioned in the article... that does necessarly implicate that my observation is 'in direct violation' with what is described in the article. This is an example of 'rethoric nonsense'... for, just because I described a detail that is not mentioned in the article, that is no basis to claim that my observation violates the article. Afterall, the researchers have not discussed the details in their Suwon crease example. And my comment about the width-variations seen in the major creases... is just a visual fact! You haven't explained yourself at all how you applied the guidelines in the article in order to colour the lines the way you have coloured them! 2) and because there is clearly a 'knick' visible. Patti, you haven't explained yourself how the guidelines helped you to choose the other point - even while at that point the line continues as an (almost) 'perfectly straight line'...!??? This is how I would describe II + III. Martijn, is the owner of this print 'normal'? They have unusually widely spaced ridges under the interdigital loop between the little and ring fingers and many small minutiae under the index - between the heart line branches. Additionally the 'string of pearls' along the outside of the life line - some kind of health issue or physical weakness? Yes I did describe why I colored the lines as I did - using the guidelines from the report. You are welcome to your interpretation, but even in this post you have acknowledged that it is your opinion to compare the width of II with III and not in the report. You pat yourself on the back for your viewpoint (with no support from anywhere) and then call my opinions fantasy. When someone takes the approach that their ideas are absolute fact there leaves little room for discussion. taking sides? I'm not sure where that came from. It's not about taking sides, it's about how I understand things. There are 7 pages to this discussion, surely Patti you don't expect me to go thru every comment! So far in this thread I agree with Martijn's interpretation of the Korean paper, except for his assertion that in this example, accessory II is parallel / horizontal to II. I can understand where you are coming from in many of your ideas Patti, but they are extrapolating from the ideas presented in the Korean paper. Maybe in the future you will be proved right, but for the moment all we have to go on are the words & pictures presented in the research paper. We need more than this to be able to understand all variations of this crease properly. But from the limited info we have so far, I don't see anywhere that Martijn misinterpreted it. Does that answer your question? Martijn says II must be parallel to the II part of II + III. and the thickness or thinness of the II part of II + III is compared to III part and Accessory II. If you agree with Martijn can you show from the report why? I think from our discussions before you left town, the part you disagreed to was a long heart line extending to the radial edge as being related to the Suwon. Thanks for the clarification as to your disagreement Patti. NB I have edited my previous post in hope of making it clearer in what way I agree/ disagree with Martijn. re Martijn says II must be parallel to the II part of II + III. That's also how I read it, given their definition of 'accessory' line. re "and the thickness or thinness of the II part of II + III is compared to III part and Accessory II." erm.... maybe I haven't read / understood this part properly! sorry but I can't remember our discussions from last month! I will study this thread & the other suwon thread again tomorrow. The accessory crease is parallel to a major crease i.e. I, II, and III. The Koreans do not mention anything regarding Accessory II or Accessory III being parallel to any part or all of II + III. II + III is not II and it is not III, it is "II+III". In my opinion this too is extrapolating. Is that okay when you agree and not okay when you don't? Suwon crease (D): II and III meet accompanied by accessory II. Fig. 5. Variants of distal transverse crease (III). .....Accessory variant (C): III is accompanied by accessory palm creases which are parallel and more than half of the III length. I don't think the Koreans implied anything. They say the report is comprehensive. The Sydney Crease and the Simian are included throughout the report and labelled II + III. Why would they leave it out and hope it would be implied by the use of I, II and III. Especially when they clearly define I, II, III and II + III plus Accessories II and III. Surely if II + III was meant to be included it would have been easy enough to include it. Accessory II in the Suwon is most likely a lot longer than the II part of II + III as it is probably a fairly normal PTC or head line. (but that isn't in the report either ) Obviously not criteria.